We started Vinayak Bulk Movers in the year of 2000 with the goal of providing efficient, high-quality bulk transportation services with competitive prices, and according to our customers we have lived up to that goal for more than 10 years. We started out serving the chemical and food industries. Then, at the request of our customers, we expanded our service to include other industries and other modes of transportation. Vinayak Bulk Movers has a unique place in the market due to our long history and in-depth knowledge of transportation logistics. Our team is made up of experienced, talented individuals, with backgrounds over the spectrum of third party logistics – operations, regulatory, and administrative. This broad base of experience contributes directly to assisting you in achieving the results you need to maintain your competitive edge. 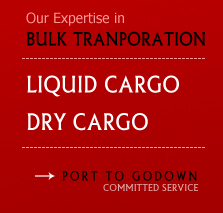 At present we are transporting the all kind of Dry and Liquid products like Refined Oil, Vanaspati and Edible Oil etc., to below mentioned the clientele. Cargill India Pvt Ltd, Bhimasar. Gokul Refoils & Solvents Ltd, Anjar. Gandhar Oil Refinery India Ltd, Mumbai. JMD Oils Pvt Ltd, Bhimasar. Ruchi Soya Industries Ltd, Gandhidham.